Standing for long periods can pose a postural problem leading to painful conditions. We know sitting for long periods is unhealthy, however, does this mean standing is better? Standing is a posture often used at work and almost half of workers spend about 75% of the time standing and almost half of these workers do not have the ability to sit when they want. Standing for long periods is associated with back pain and problems with the legs and feet. 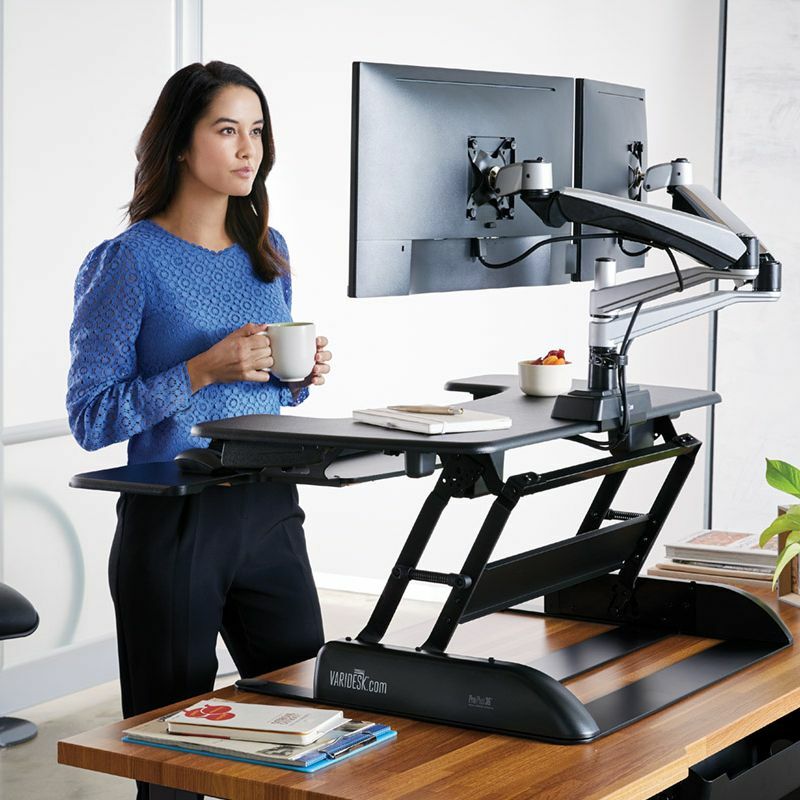 Many health care professionals are recommending standing more than sitting, however, standing for long periods can be just as detrimental to health as sitting. We therefore need to find a balance between standing and sitting. Much has been written about better ergonomics for sitting correctly to avoid painful conditions; lets look how we can improve our standing posture. What is the Best Standing Posture? Make sure you stand upright. Standing upright requires use of the postural muscles that need to be strong to maintain the best standing posture. The head should be straight with the chin slightly in to avoid forwad head posture and neck strain. The best way to do this is to make sure the ears are held over the shoulders. The shoulders should be held slightly back to avoid the rounded shoulder posture that can lead to upper back problems as the muscles between the shoulders become overstretched and weak. The arms should be relaxed down and not held up as this can lead to a painful trapezius muscle. The knees should be straight, but not locked. The posture of the back should be natural, slightly holding the stomach muscles so the pelvis does not tilt forward. Allowing the pelvis to tilt forward leads to a sway back posture that weakens stomach muscles and stresses the back muscles and joints. The feet should be at shoulders width and the weight should be at the balls of the feet and not the heels. Grasp the ground with your toes to motion away from the heels and get a feel for the balls of your feet. If you need to stand for long periods, shift your weight from the right and left foot and also rock slightly from the balls of the feet to the heels. This can help increase blood flow and reduce strain on the legs and feet. A 2017 systematic review of laboratory studies in the journal Gait & Posture indicated leg and/or back pain developed from standing after 71 minutes in general. In those prone to develop pain from standing, the tolerance level was reduced to 42 minutes. The authors recommend refraining from standing for prolonged periods greater than 40 minutes. A 2018 study in the journal PLoS One found that back pain related to prolonged static standing was related to lumbar disc pressure and that compressive forces on the disc may be a factor in developing back pain. A 2018 study in the European Journal of Applied Physiology found that prolonged standing increases arterial stiffness, an indicator of cardiovascular health. Two hours of standing was enough to cause an increase. This was not alleviated with 5 minute walking breaks every 25 minutes. Sit-Stand Desks are called that for a reason; it seems most beneficial to alternate between sitting and standing. The above study indicates that standing for two hours at a time is too much, so alternating positions using variables within a two hour time frame seems most reasonable. Standing in good posture not only feels better, but it looks better too. It is much more health for the muscles, ligaments, joints, blood flow and self esteem. Alleviates muscle fatigue by increasing efficiency and decreases the amount of energy needed. Allows better function of ligaments for increased motion. Eases stress on lower back and muscles. Helps with confidence and better appearance. By following the tips for better posture, you will be training the muscles that will help to maintain better posture. It may not feel natural at first and can cause some soreness initially because the muscles need to get used to holding and working better. Try to spend some time each day working on your posture. It can be just 10 minutes at first, then progress a little each day or week. It takes time to form new habits, so don’t expect results overnight. Being persistent will pay off in the long run. realize that this takes some effort; muscles need to work differently, ligaments slowly adapt, and gradual change can take place with 6 to 8 weeks of effort. Soon, you will be able to feel more at ease and comfortable with your new posture, as it requires less effort to maintain. Others may notice the difference, noting something is different about you, but can’t quite put their finger on it. Some will have more difficulty with this than others. It depends on your desire and some have musculoskeletal problems like arthritis that can make it more challenging. Certain areas may need more specific exercising and stretching. Starting with simple neck rehab exercises as well as back stretching and exercising may need to be looked into to help. You can consult with a chiropractor or physical therapist for advice, evaluation and/or specific instruction or treatment when necessary to help with better standing posture. As indicated above, if you have to stand, making use of a footrest or platform can be an effective, yet simple solution to avoid or reduce back pain while standing. A 2019 study in the journal Human Movement Science found that alternating standing level and with one foot on a platform reduced low back pain during a prolonged standing task among documented sufferers of standing back pain. The authors found that alternating both feet on the ground with one foot on a footrest or platform altered back posture at regular intervals, which proved to be beneficial in pain reduction. With one leg on a platform, the lumbar spine was placed in a more flexed posture compared to traditional standing. However, it was the changing postures that most likely contributed to the positive effects. In the study, participants stood for 80 minutes while alternating 3 minutes on both legs and 1 minute with either foot on the platform. This resulted in more than 80% improvement for those who get back pain from standing. While this is a study and used controlled factors, modifications are always necessary for implementing this strategy for different applications. However, attempts at altering postures instead of maintaining static postures is a basic idea, and the study gives an idea of how even slight posture changes at frequent intervals can make a difference. One may assume that larger postural changes, like sit to stand, might obtain similar results with less frequent alterations of cycles of changing postures. One may also incorporate this strategy in the standing phase as well.